Rather than crushing Call of Duty: Black Ops pirates beneath their heels, cybercrime investigators are killing them with kindness. If you have the mindset of the RIAA or Gene Simmons, pirates are the lowest form of scum that should be sued into oblivion. On the contrary, Activision Blizzard appears to be taking a softer approach when it comes to those involved with illegitimate copies of Call of Duty: Black Ops. An investigation firm has reportedly been taking it easy on those it finds buying or selling the game early. A wise old sage that I rescued from behind a locked door in the last floor of a dungeon once told me that you catch more flies with honey, and according to reports this also is the IP Cybercrime investigation firm's current approach with Black Ops pirates. Copies of the game are known to be in the public's hands already, but SWAT teams aren't exactly bashing down the doors of piracy suspects. IP Cybercrime investigators told VentureBeat that this doesn't mean there isn't a sense of urgency in dealing with the leak of Black Ops. "We know that a couple of leaks start and then it can spread like crazy," IP Cybercrime's Rob Holmes said. Early Black Ops buyers and sellers can be found fairly easily with records from Xbox Live and through postings on Craigslist or Facebook. Once found, Holmes revealed that his company is primarily just asking pirates to stop, for now. Investigators have been meeting with Black Ops sellers in coffee shops and most have been giving up their illegal copies of the game without issue. When one pirate was giving IP Cybercrime trouble, the investigators simply called his mother. This is a far cry from getting the FBI involved. 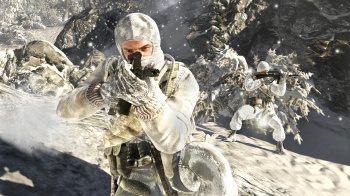 One alleged buyer of an early Black Ops copy confirmed the reports of politeness, in lengthy manner. He says that IP Cybercrime called him on the phone and asked that he not distribute the game. IP Cybercrime then offered to send a courier to pick it up and return it to Activision. The only consequence this buyer evidently faced was the loss of a few hundred dollars due to purchasing the illegal copy. This method makes sense for a few reasons. For one, the leak of Black Ops doesn't seem to be widespread yet. Secondly, making sure that the copies are returned is probably a lot easier than the pain, and costs, of litigation. Thirdly, the investigators may have just been trying to find the original source, sort of like how lower levels contraband dealers will get off scot-free if they give up their suppliers, and the Black Ops source is in for an eventual smashing. While this is also a form of good PR for Activision in a strange way, it also makes me wonder if pirates will be more likely to download illicit copies in the future if they think they'll only get a stern talking to.